It entertained me long enough for the timer to go off. So, here’s the recipe. It’s guaranteed gluten- and Girl Scout-Brownie-free. Brownies are not the most difficult recipe to convert to gluten free…since they do not contain a large proportion of flour. Rediscovering brownies from your own converted recipe or someone else’s can give you a bit of a confidence boost when you first start along this gluten free journey. Even with gluten a truly great brownie can be elusive. 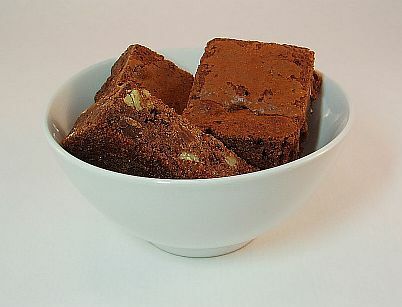 The texture must ride the edge between fudge and cake without leaning too far over to either side. The chocolate must dark and deep but still sweet. I have offered this version to other gluten eaters and received compliments on them simply as great brownies…not just good gluten free brownies. Enjoy! This is a large batch of brownies…feel free to halve the recipe. Inspired by Ina Gartin’s Outrageous Brownies. Melt together the butter, 1 pound of chocolate chips, and the unsweetened chocolate in the microwave in 20-30 second bursts, stirring after each one. Set aside to cool. Stir together the eggs, vanilla, and sugar. Stir in the warm chocolate mixture. Stir together 1 3/4 cups of the flour, baking powder and salt. Add to chocolate mixture. Toss the walnuts and other package of chocolate chips with 1/4 cup flour to coat. Then add to the chocolate batter. Pour into prepared sheet pan. Bake for about 15 minutes then take out pan and rap the pan against the oven shelf to allow air to escape from between the pan and brownie dough and rotate pan for even baking. Bake about 15 more minutes, or until tester just comes out clean. Do not over bake. Cool thoroughly, refrigerate well and cut into squares. I love Ina’s brownies. Now that we are gluten free I was wanting to try them. When I usually make brownies I use oat flour, but I add xanthum gum. I noticed you did not have this in your recipe. Do I need to add this?